‘The Twelve Days of Christmas’ is a merry song but, in reality, the dark days between Christmas and New Year always feel odd to me. Hanging in a kind of limbo. The time between me being banned from the site and gaining access to Giuseppe’s photos felt much the same. Wednesdays no longer had the same sense of purpose. 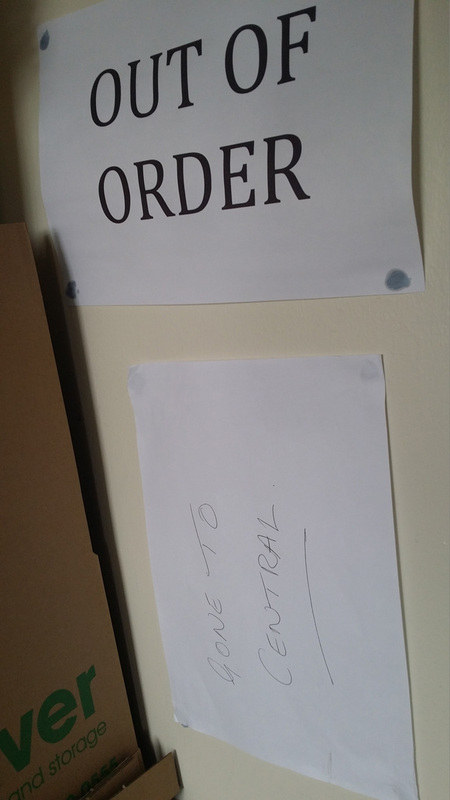 However, on Wednesday 1st June the game changed. 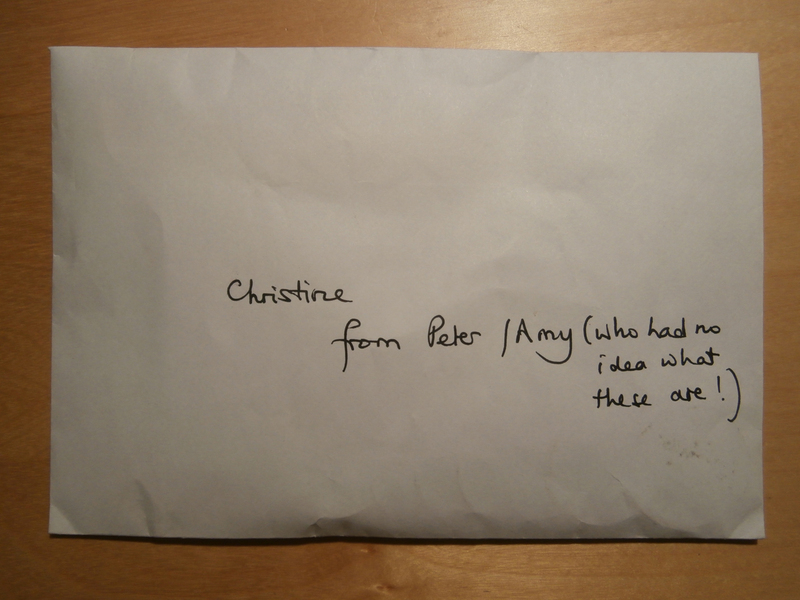 At Briefing in the NHSG Staffroom that morning, I found an unexpected envelope in my pigeon hole bearing an intriguing message: ‘Christine: from Peter/Amy (who had no idea what these are! )’ The handwriting looked to me like Hilary’s. 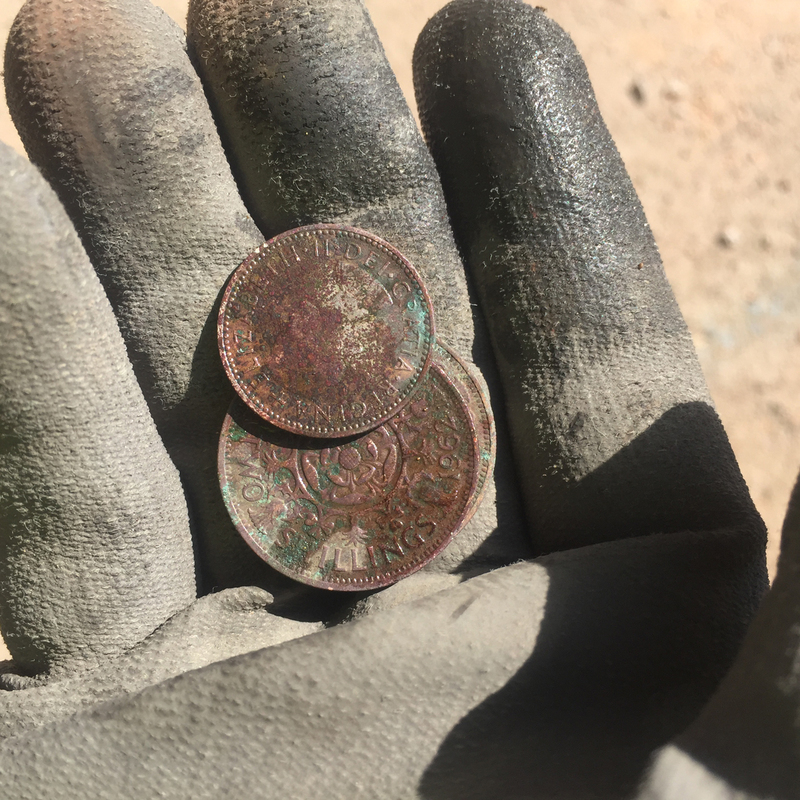 I slipped the contents into my left hand: seven rusty coins! 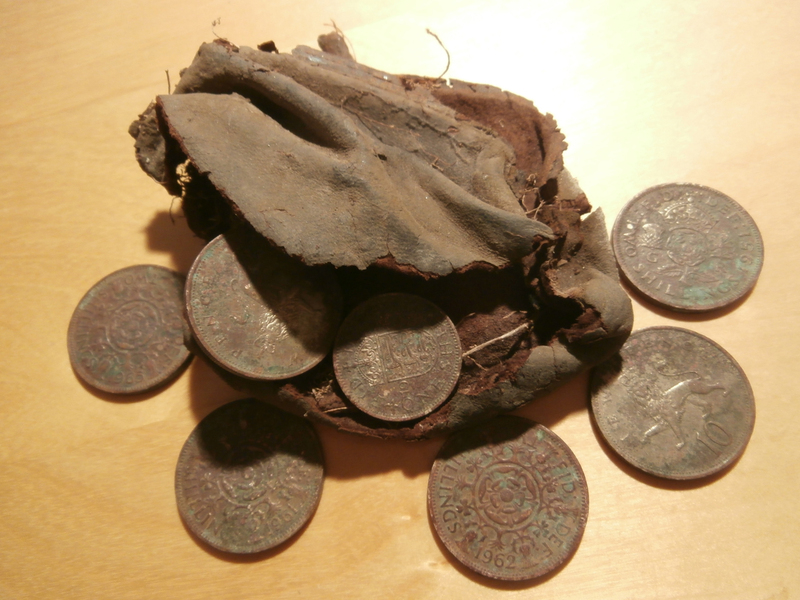 ‘The Tankerville Treasure’: seven very tarnished silver coins. It was clear from the names on the envelope they must have come from the site, but how and why they’d been sent on to me was a mystery. I mentioned them to John Crosby that afternoon. He knew nothing about it, but confirmed the ‘treasure’ wasn’t that old. With a wry smile on his face, he hinted it was possible the purse might be about to come my way too. After that morning’s site meeting with Wates, he had seen Amy hand over something to Hilary. And sure enough, at Briefing the next morning, Hilary entered gingerly cradling something indeterminable and brown-looking in one hand. Thanks to Amy, the coins were reunited with their purse. I remained amused and puzzled for some while, but eventually the story behind the ‘Tankerville Treasure’ finally came to light. For those ‘Old Girls’ old enough to remember the school play ‘Daisy Pulls It Off’, it didn’t involve any night-prowling around the building, breaking secret codes or even a mysterious stranger whistling ‘All through the Night.’ The trail led me back to Giuseppe, of course. 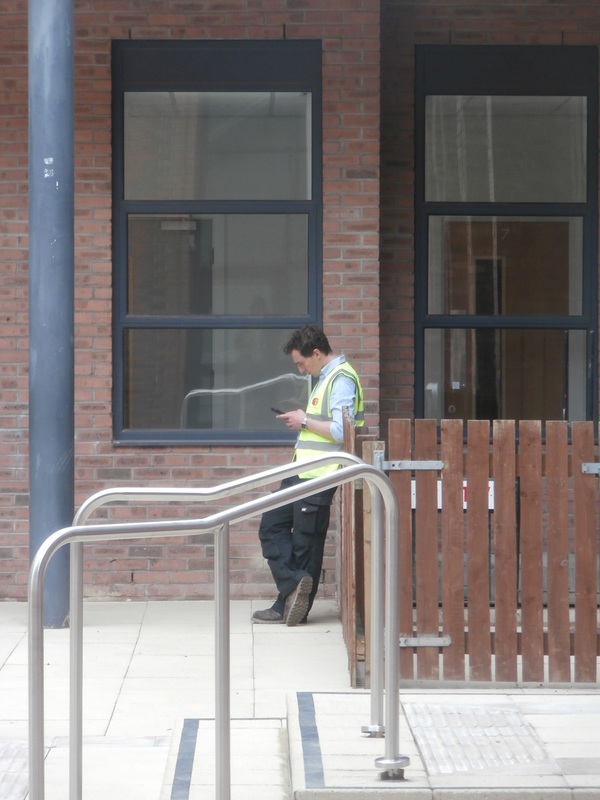 I must admit to being totally unaware of the existence of this ‘free-standing’ brick wall at the back of the Main Building, but here are Buildroute starting to dismantle it on May 23rd. 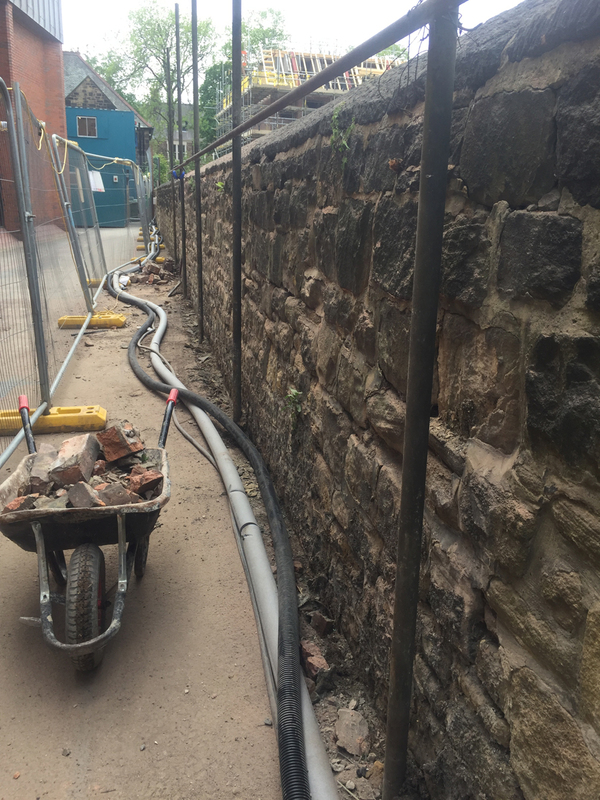 ‘These were found when a freestanding section of brick wall was removed last week. I believe this wall was built at some stage in the recent past to probably hold some sports signage on the 5 metal posts that it supported. 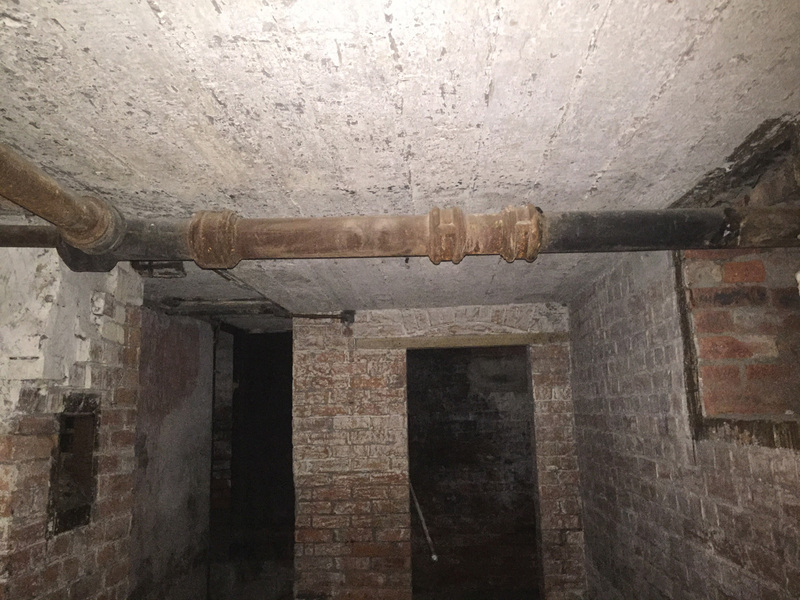 5 metal posts are now revealed against the original brick wall. I don’t recall any sports signage ever having been erected here in my time at Church High, just metal netting along the top. 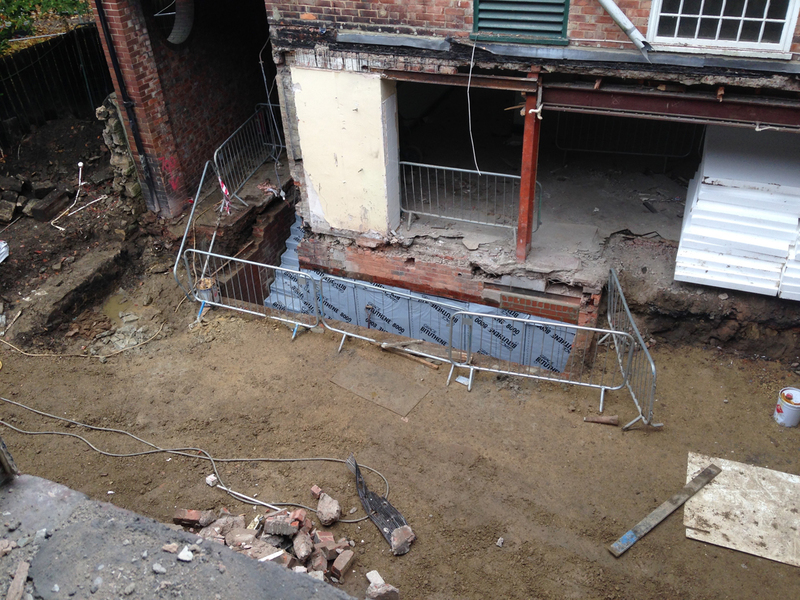 ‘The coins and purse were found by the bricklayers from Buildroute last week. 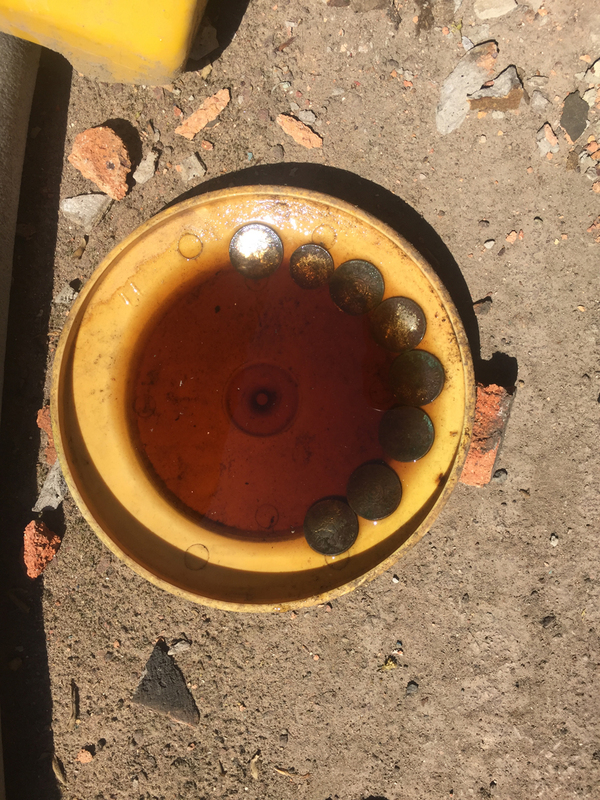 I saw them on the floor where the bricklayers had left them in a dish with coca cola, so they could descale. I asked if I could take 2 for the school and then they offered all of them for the Client to keep. The coins ready to be descaled in coca cola (I don’t know about you, but I am counting 8 here!). Giuseppe asks for 2 to go to the Client. 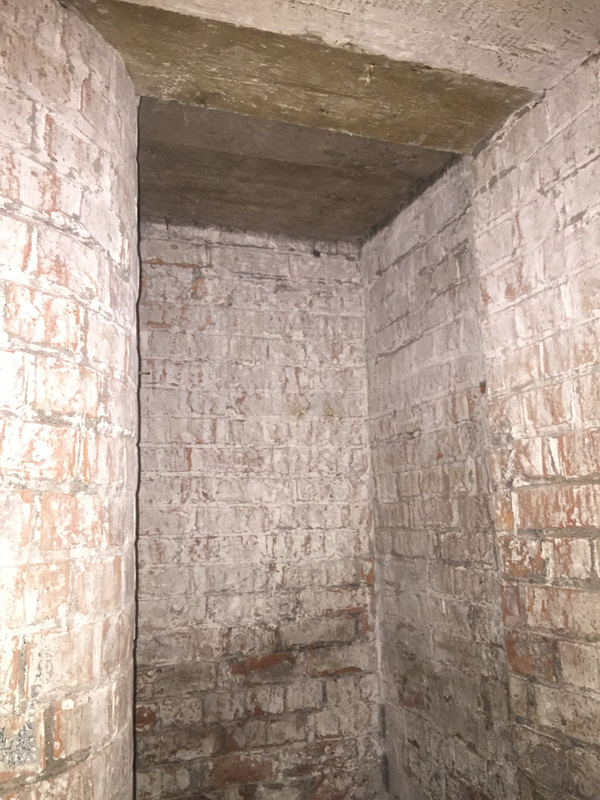 The wall gap where the purse and coins were found. Also quite a few other items too! The number of tennis balls should be no surprise. Beyond this wall (the old gate is still visible at the end) were the 5 Fleming Hospital grounds tennis courts we used to use. I haven’t seen many of them – and there must have been hundreds – but Giuseppe’s Clerk of Works work schedules have always been fascinating to look at. 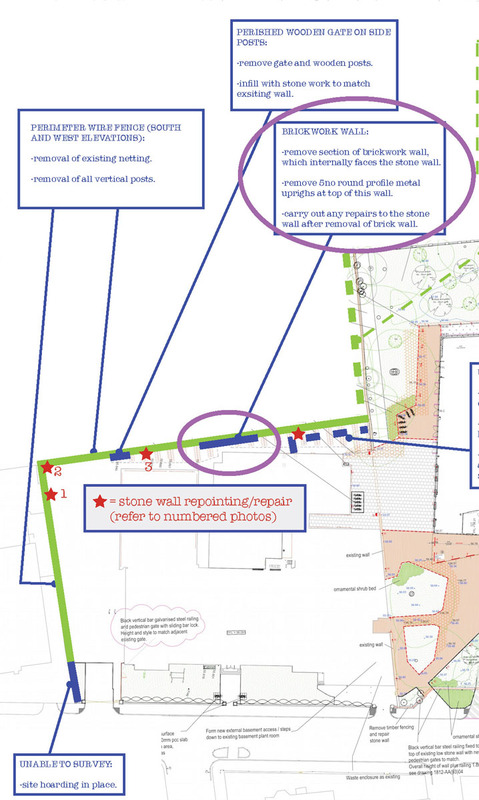 This detail from his schedule for May 14th shows the exact nature of the work going on in this area of the site. 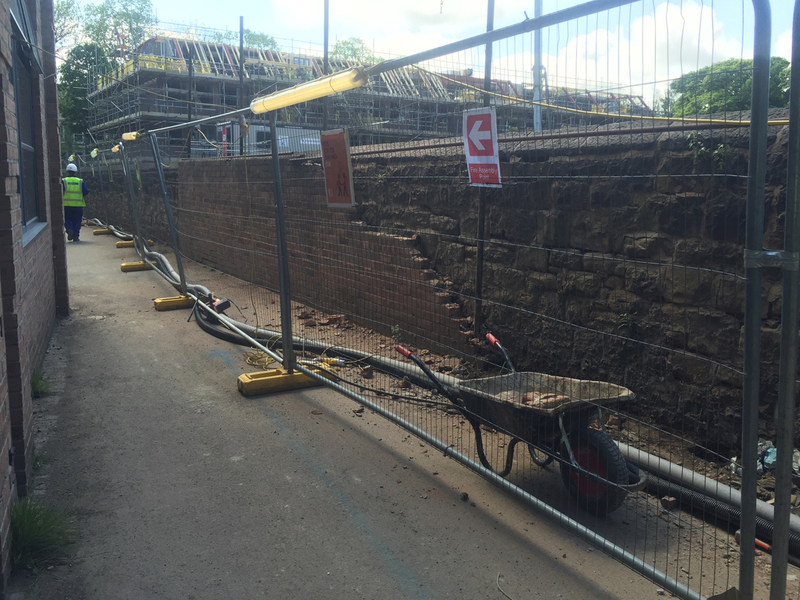 The removal of: the existing netting and post supports on the south and west elevation perimeter walls; the free-standing brick wall and the 5 metal uprights; and the perished wooden gate on side-posts. Section of the CofW schedule for 14.5.16. 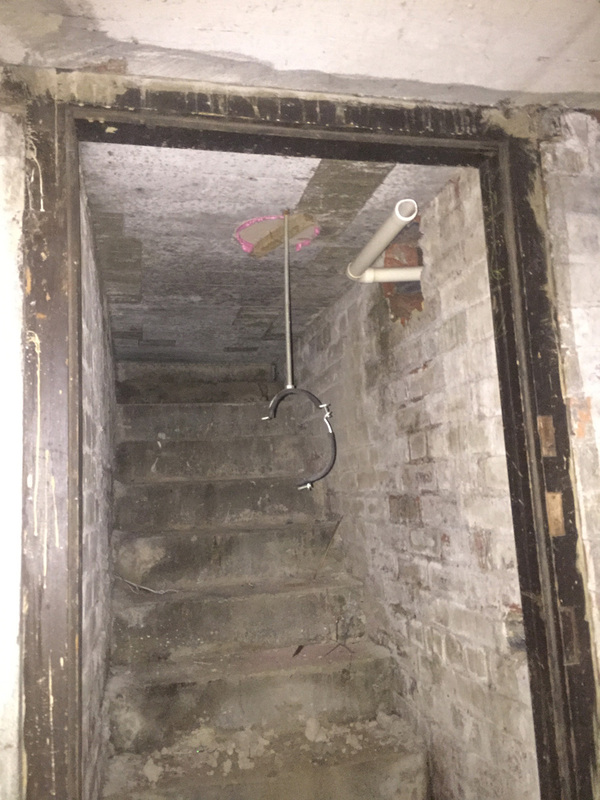 The purple circle marks the spot where the purse was found. It’s strange the existence of the wooden gate in the perimeter wall at the back of the building seems to have passed me by too. ‘Familiarity breeds contempt’, as the old saying goes. 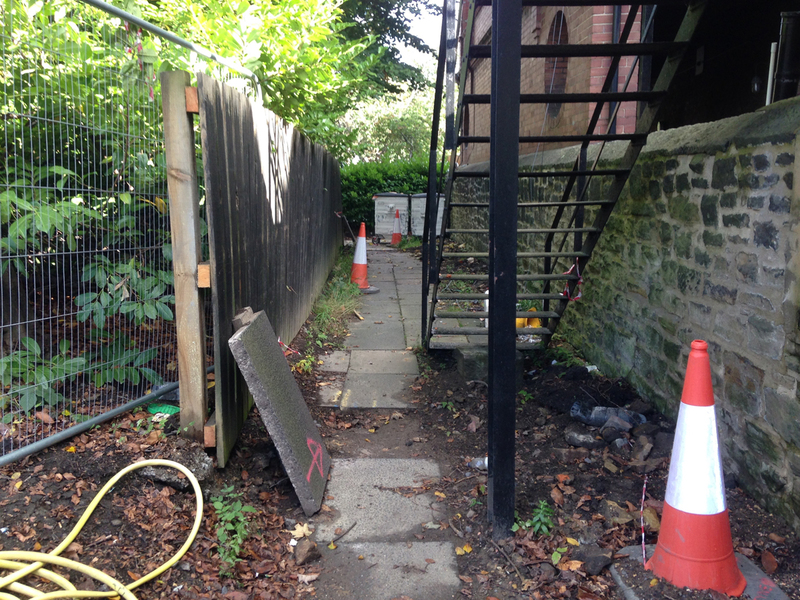 As I mentioned in a previous post, this was the gateway created in the stone wall to allow access to the five tennis courts School used within the Fleming Hospital grounds thus avoiding girls having to clamber over the wall. Close-up detail of the Fleming tennis courts gate c1950s. 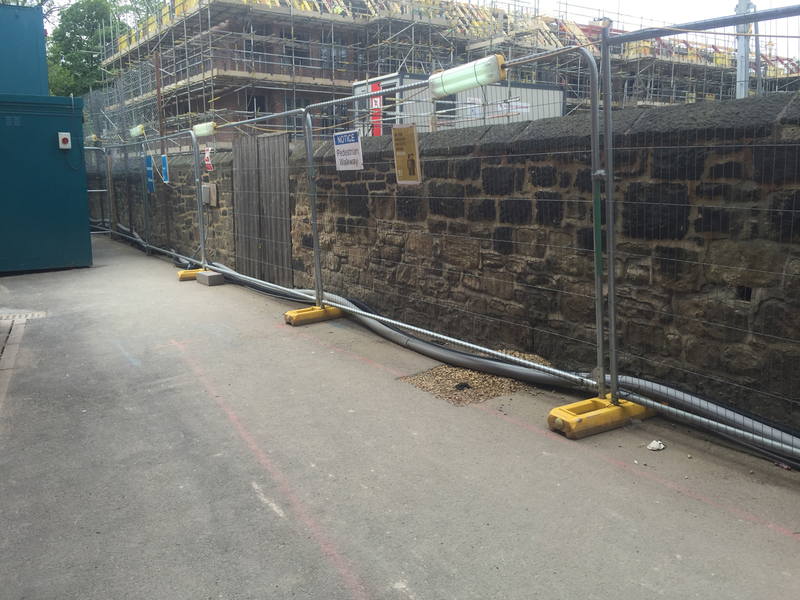 So, over the years, holes in walls have clearly proved useful at Newcastle High/Church High. No doubt to access the hockey pitch girls used to use in the Orphanage Grounds too. Holes have the propensity of allowing things to travel through them – or into them in the case of our purse and coins. 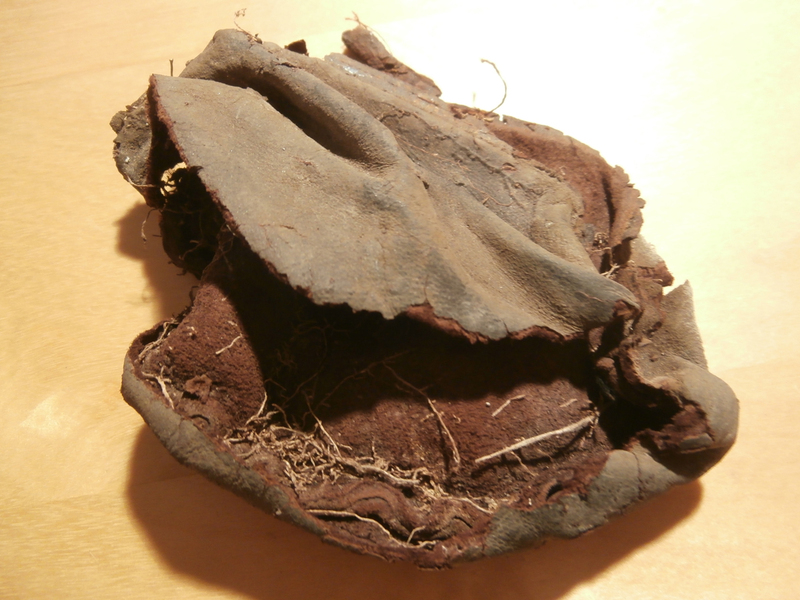 I prefer to think the brown suede leather purse once belonged to a Church High girl, perhaps a young girl throwing it carelessly up into the air while playing outside. If that sounds unlikely to you, believe you me, I’ve seen shoes, etc. getting wedged in all sorts of strange places this way over the years. 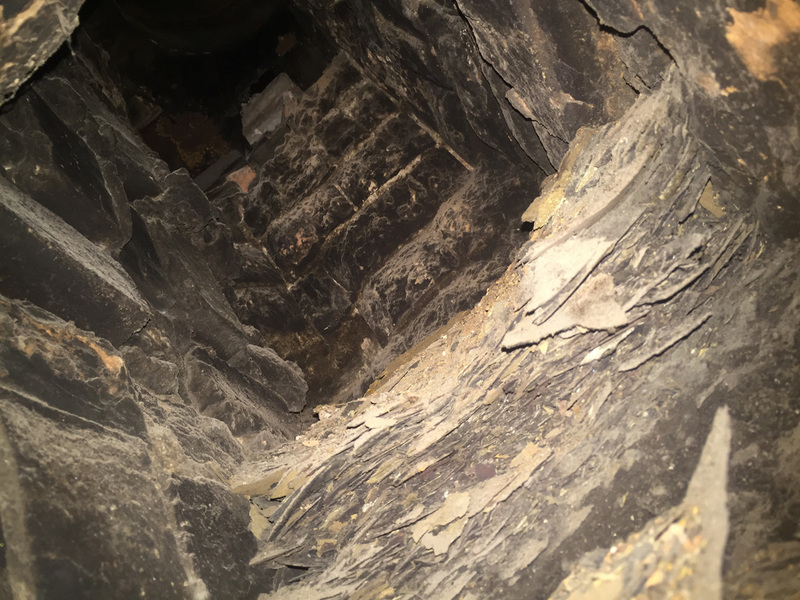 Since the ‘Tankerville Treasure’ hoard of four silver two shilling coins, one silver shilling and two 10p pieces contained both ‘old’ and ‘new’ money, the purse must have found its way into that hole in the wall between 1968 and the early 1970s around Decimalisation Day. 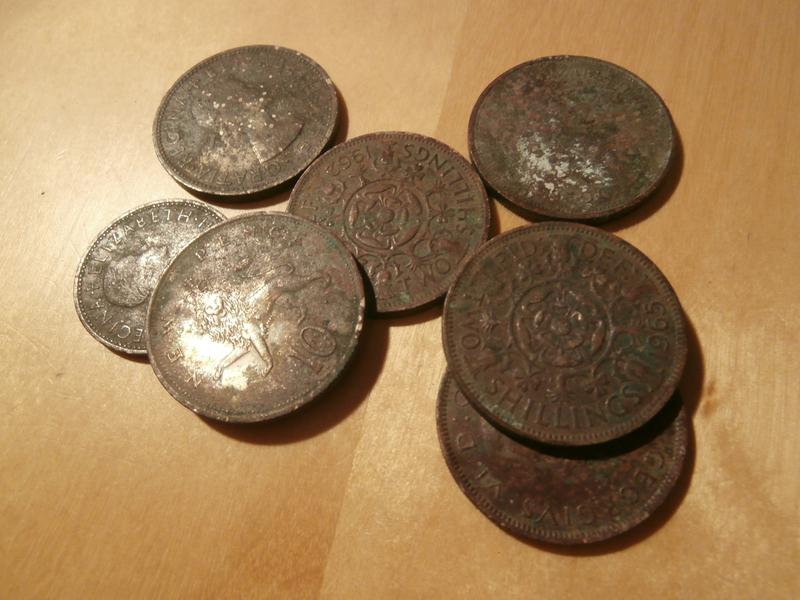 The ‘Hoard’: 4 two shilling coins, 1 shilling & 2 ten p pieces. In today’s money, the sum of the purse contents is just a measly 65p but the historic inflation calculator suggests this translates as a loss of £9.66 at the turn of the 1970s. So some girl must have felt that! But as ‘one man’s loss is another man’s gain’, I guess we have been the recipients of the good fortune on this occasion. It makes a nice little story, I think. For however much I love the building, it has always been the people who have made this school. As it should be. 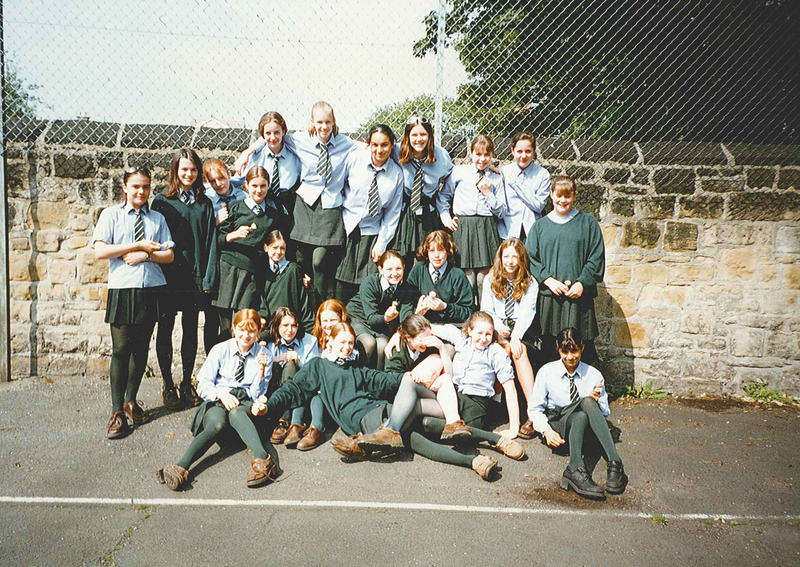 The wire-fenced periphery wall & girls in green, early 1990s. 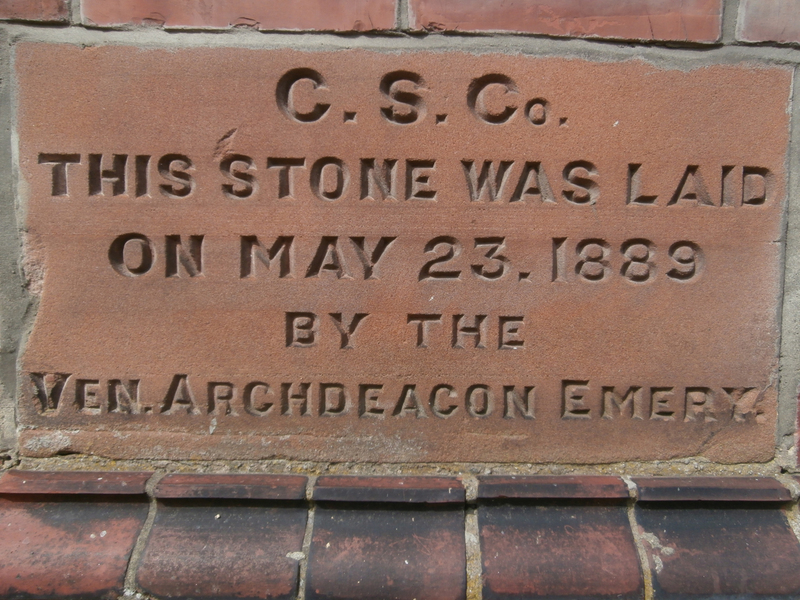 We know of the dedication stone, still there to the left of the main entrance of Newcastle High School for Girls, but how many people really know about the beginnings of our school or who Archdeacon Emery actually was? Because he was important. To Newcastle High School, to The Church Schools Company and to the Church of England as a whole. 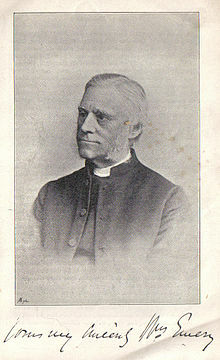 The opening line of his Wikipedia entry sums him up as follows: ‘The Ven William Emery, MA (1825-1910) was an Anglican priest in the late 19th and early 20th centuries, who has been labelled the ‘father’ of Church Congress’. Present at the first meeting of the Church Congress in 1861, he was appointed permanent Secretary in 1869 and by 1907 had been present at every one of the first 47 Congresses. A more detailed summary of Canon Emery’s life can be found via Wikisource (Dictionary of National Biography, 1912 Supplement). It ends this way: ‘He was also instrumental in founding the Church Schools Company for the promotion of the religious secondary education of the middle classes (of which he was chairman 1883-1903)’. Archdeacon William Emery, a founder of The Church Schools Company. But unlike Ms Moberly, we know William Emery did actually leave a permanent ‘mark’ on the world, the day he travelled north to Newcastle whilst still an Archdeacon to lay the dedication stone in the side door (the Girls’ Door was its original position) of Newcastle High School. The words on this stone are the beginning of our story. In the beginning, this stone was laid by the south side door. “In extraordinary times, the ordinary takes on a glow and wonder all of its own.” Google tells us this quotation is from a book called ‘Human.4’ I don’t know the book, but I like the idea very much. It perfectly sums up my motivation in photographing the Church High buildings pre-merger and also what ultimately drove me to start writing this blog. It’s ironic that if the merger hadn’t happened, my relationship with the building would be very, very different and I would know so much less about it too. And the same would apply to you. For how long, I wonder, would all those voices from the past (imprinted on the building and carried in our collective memory of ‘The Old Church High’) have remained silent? Because as Mike Lancaster wrote elsewhere in ‘Human.4’: “I think that’s what we all want, in the end. To know that we left footprints when we passed by, however briefly. We want to be remembered. So remember us. Please. 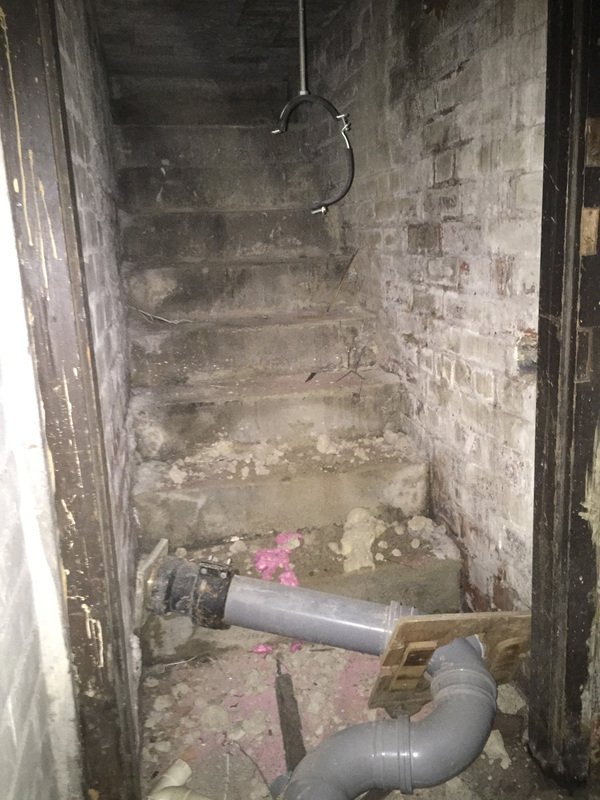 Remember us.” If those old concrete stairs could talk, whose voices would we hear? Why the voices of past Newcastle High caretaking staff, of course. Victorian School Caretaker’s House tucked away in a corner of the playground (www.derelictplaces.co.uk). I was researching Victorian school caretakers (there’s not much to find) when I came across this sad-looking house via Google images. It gave me the shivers. 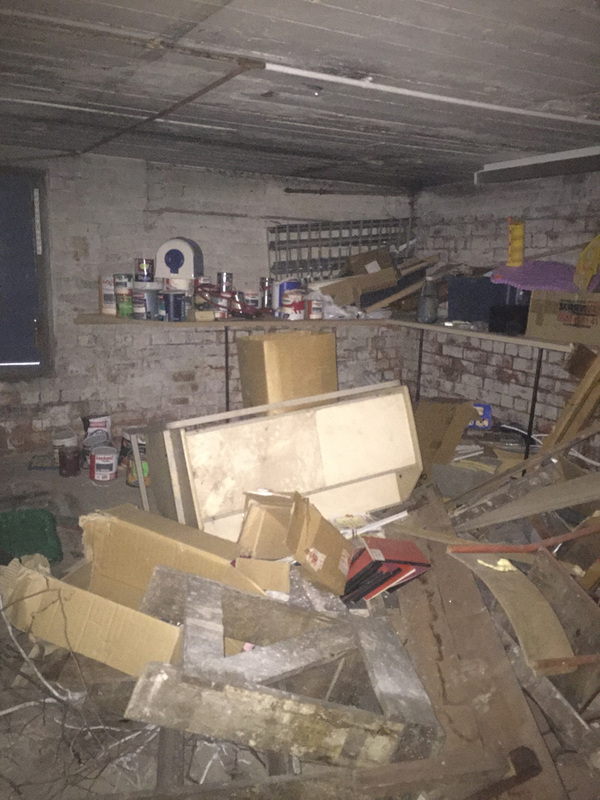 What happened to our building was bad at the time, but the derelict places website which documents decaying places, made it clear to me neglect would have been so much worse. 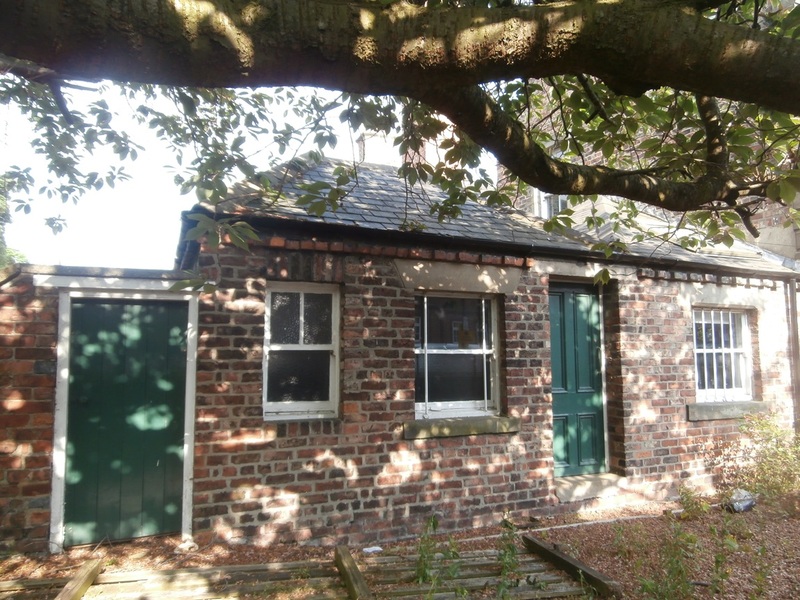 Did you know there was once a caretaker’s cottage on the Church High site? 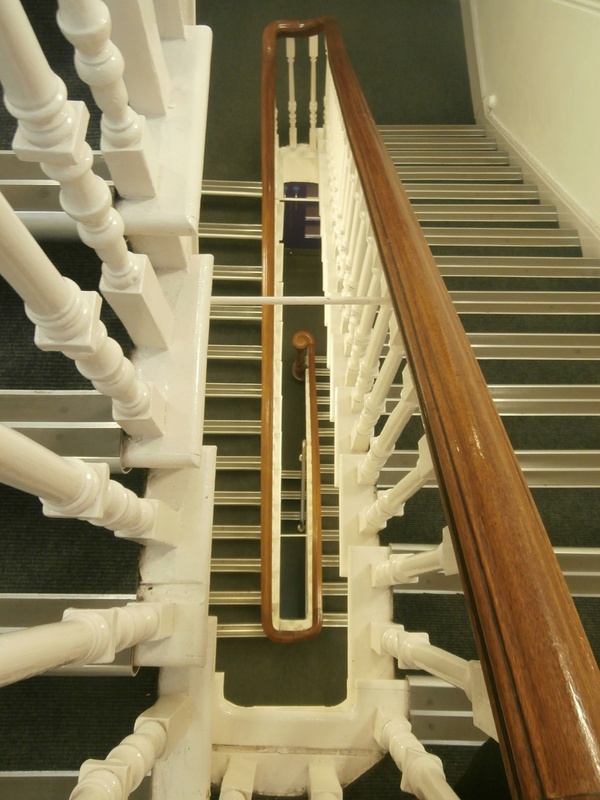 Although aware they were a standard feature of Victorian schools, neither did I until recently. 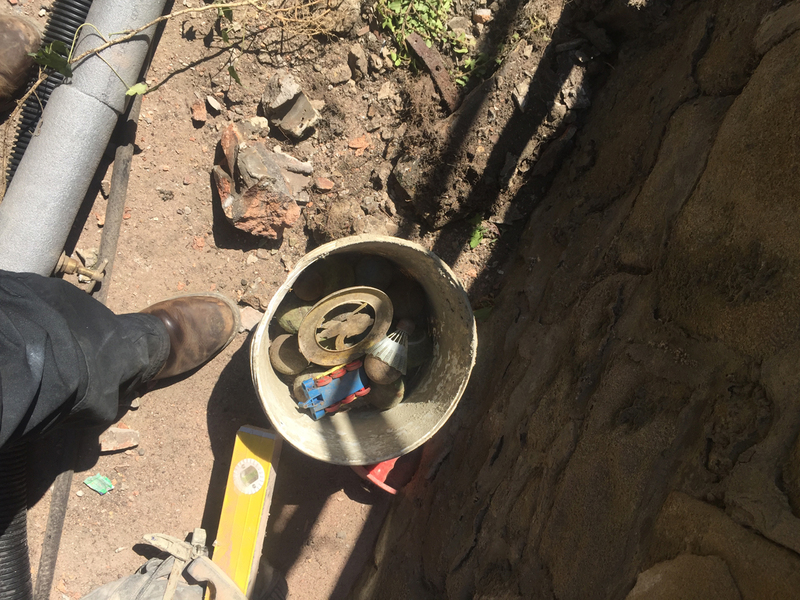 Mentions of it in the Jubilee Book clearly hadn’t stuck in my mind: ‘Among the improvements to the buildings was the laying of new drains at a cost of £200 …. 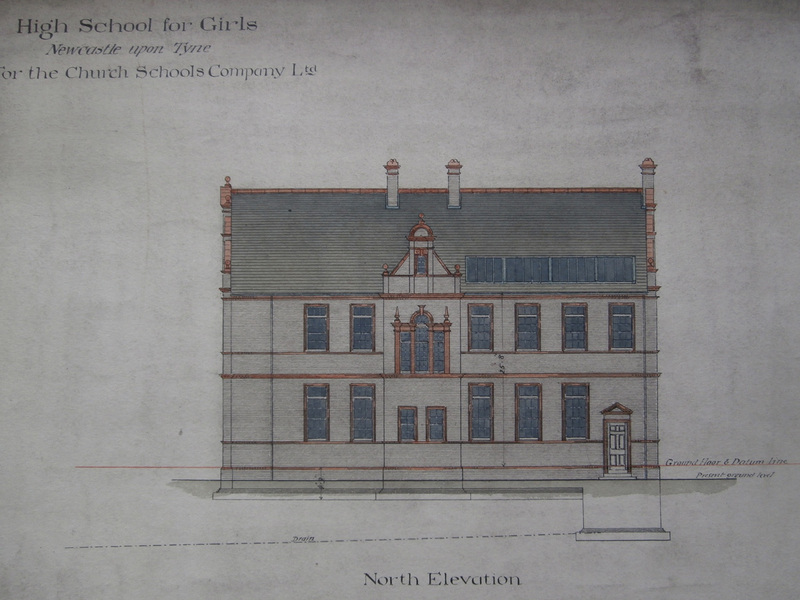 and some years later, in the summer of 1914, the building at the north end of the school of the caretaker’s cottage …. 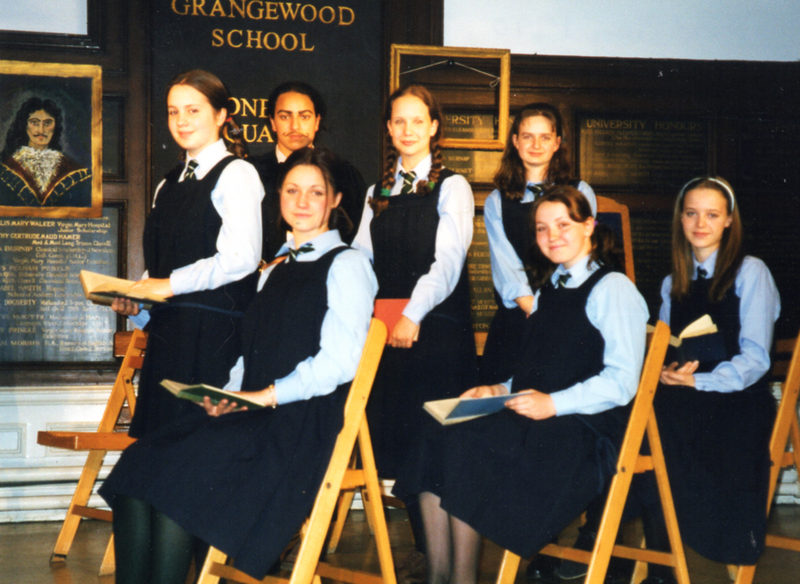 necessitated by the increase in the number of girls in the school…. 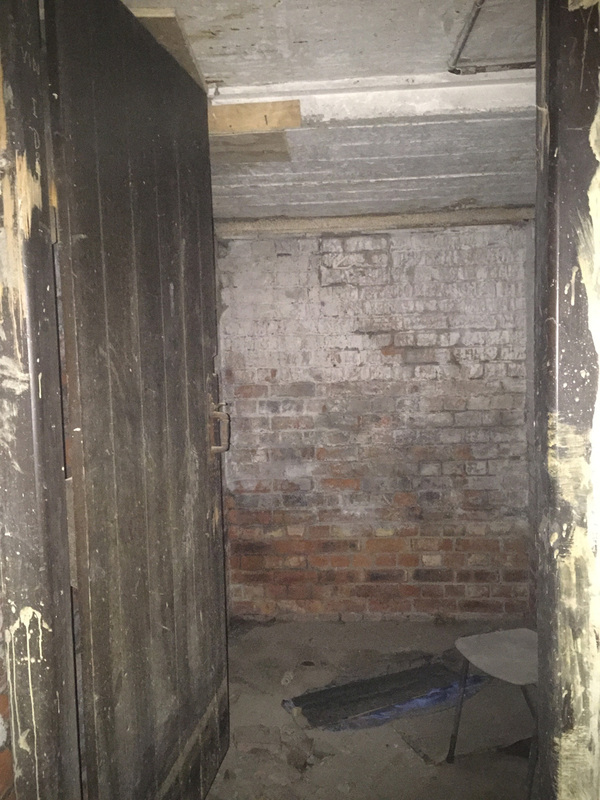 This made it essential that the rooms occupied by the caretaker (the room next to what was then the dining room) should be turned into form rooms.’ The penny finally dropped in the Tyne & Wear Archives search room. Filed under ‘Miscellaneous Photographs’ in the Church High Archive at The Discovery Museum is item E.NC17/7/24/3: 11 unidentified photographs. This bothered me. I requested the items and the photo below was among them. 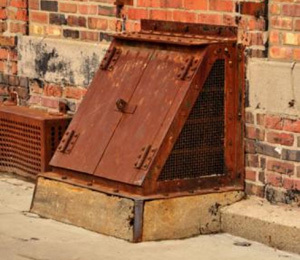 This could only have been of caretakers, it seemed to me, but where was the photo taken? I knew of no doorway looking like that. A ‘Missing piece’ of Newcastle High School history in the Tyne & Wear Archives: Mr and Mrs Waterman with Jester, the dog, who clearly had a mate/friend by this point in time. We know from the remembrance ‘The Glory and the Freshness of a Dream’ in the Jubilee Book that the first caretakers were Mr and Mrs Lumsden: ‘Sometimes Mrs Lumsden, the caretaker’s wife, came in, a bent little old woman, wearing a cap of lace and a ribbon; or Mr Lumsden shuffled through in his shirt sleeves, with heavy feet and uncertain temper. Mystery clung about their quarters, and the door on the red tiled corridor, opposite the big window, was always shut.’ Amazingly, one of the first photographs Giuseppe took in the building following the initial strip-out shows the remains of what seems to be this original red flooring. 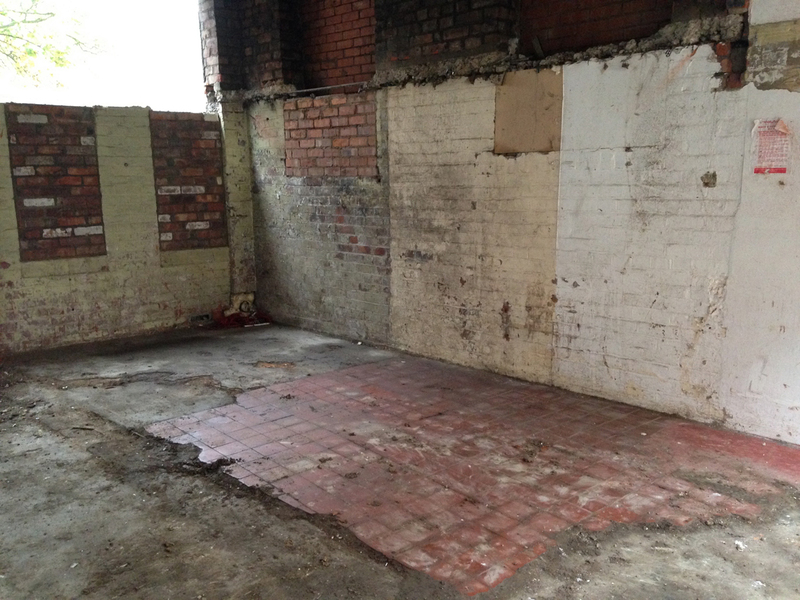 Traces of an old red-tiled floor in the north gable kitchen area. 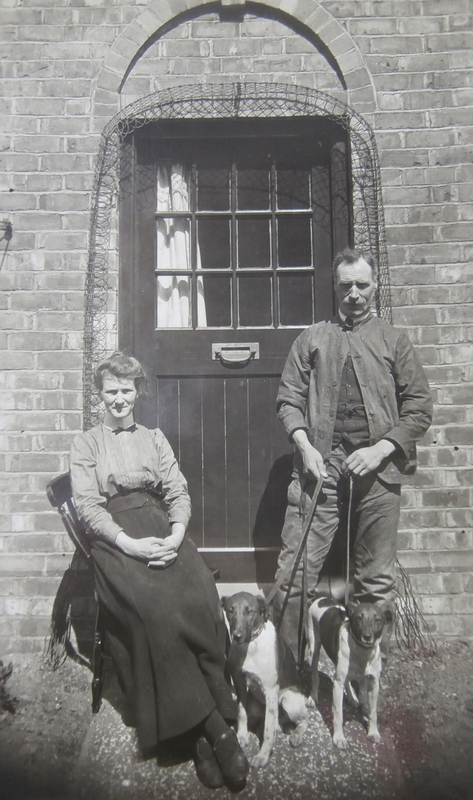 The Jubilee Book also tells us ‘the Lumsdens gave place to Mr and Mrs Waterman, with Jester the brown and white terrier, and they in their turn to Mr and Mrs Mattison, with Major, the golden Labrador.’ We learn ‘it was with special regret [school] parted with Mr and Mrs Waterman in 1926. They were known to everyone and in a miraculous way they knew and remembered every Old Girl as well as the girls in the school, whose invasion of their kitchen they bore always with good grace.’ It seems Mrs Waterman was the very first provider of Church High Cookies after ‘buns from Wilson’s ended during the war. It was then that Mrs Waterman began to dispense first biscuits, and later, to meet the demand for something more sustaining, bread and jam, at recreation.’ It won’t be a surprise to any Church High folk reading this blog that the Jubilee Book also states that ‘through the whole fifty years, the caretakers and the maids have played no small part in the happiness of the school.’ In my time there, I certainly have very fond memories of Ethel, who looked after the Head and the Staff in Miss Davies’ time so well and two characterful school caretakers, Gentian Qeku and Dave Stout. 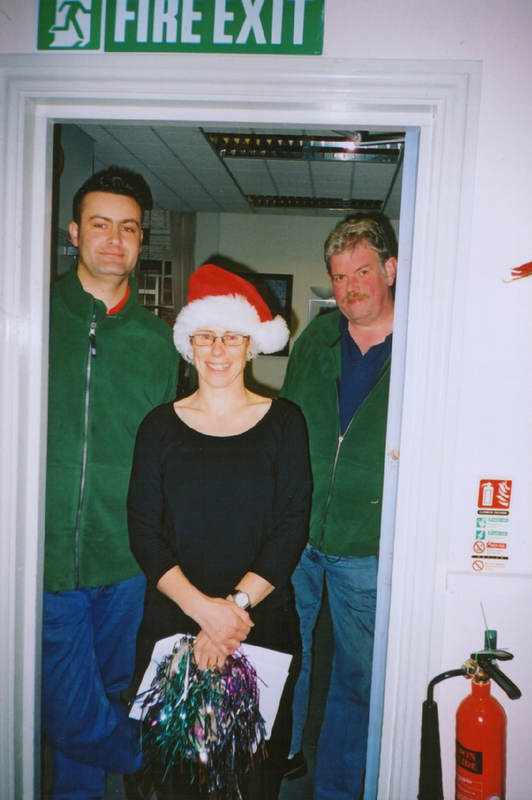 Gentian Qeku, Caretaker’s Assistant (at that time a young man fresh from Kosovo), and Caretaker Dave Stout pose with Jane Grundy on Staff Pantomime day. 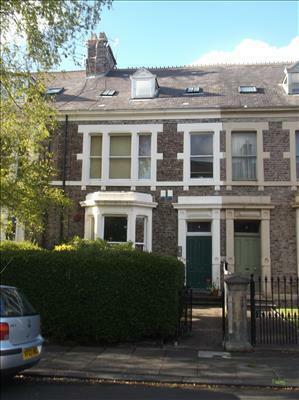 In Dave Stout’s time at Church High, the caretaker and his family (wife, Linda, and daughter, Susan) occupied 2, Haldane Terrace – the house immediately adjoining the Music Dept. at 1, Haldane Terrace. 2, Haldane Terrace used to be owned by School. 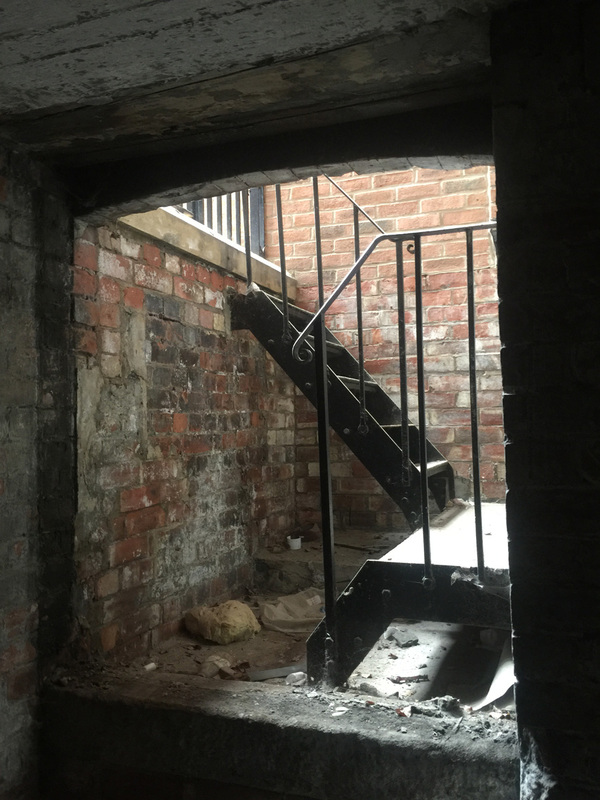 It was used as caretaker’s accommodation before being converted into flats. I first learned about the existence of a caretaker’s cottage from the Jubilee Book when the 1933 expansion plans were being described: ‘Extension at the north end was made possible by taking down the caretaker’s cottage (in place of which a flat has been built in the space under the roof).’ It’s easy to forget there was originally a lot more land on the north side of the school building. 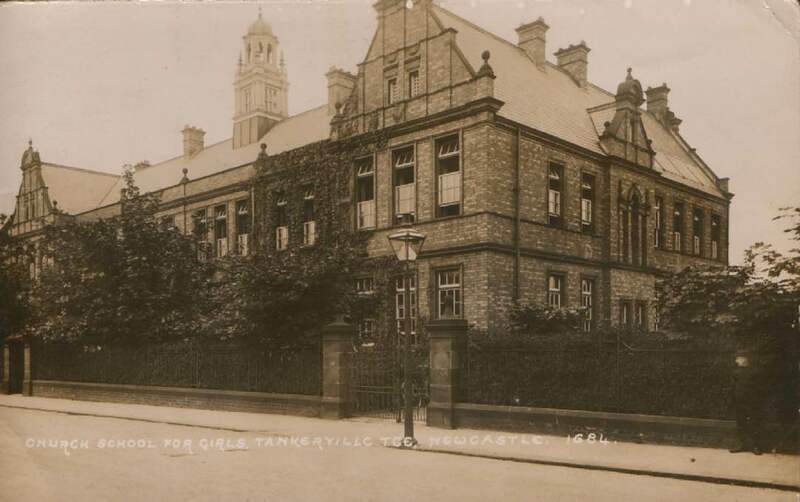 This postcard c1910 clearly shows a tree-lined gated area big enough to hold a small cottage, possibly quite similar to the domestic wing of Tankerville House . 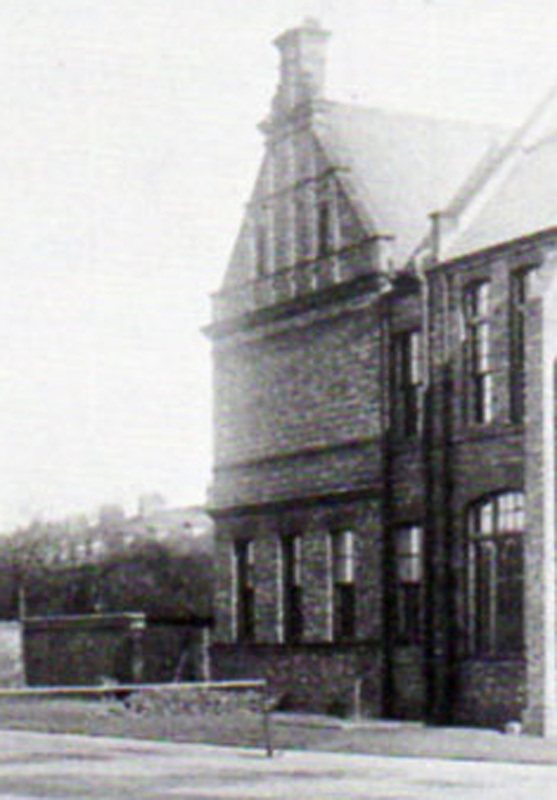 The gated enclosure to the north of the Newcastle High School building c 1910 where the caretaker’s cottage used to stand (above). The cottage was possibly not unlike the domestic buildings to the side of Tankerville House (below). It wasn’t until September when I was systematically working my way through the Plans and Elevations (E.NC17/6) in the Archive that I discovered the exact position of the cottage. I came across it quite unexpectedly on an unfinished plan of the proposed laboratory for Church High School (Wood and Oakley architects, May 1927). It appears to have been positioned more at an angle than I’d expected. 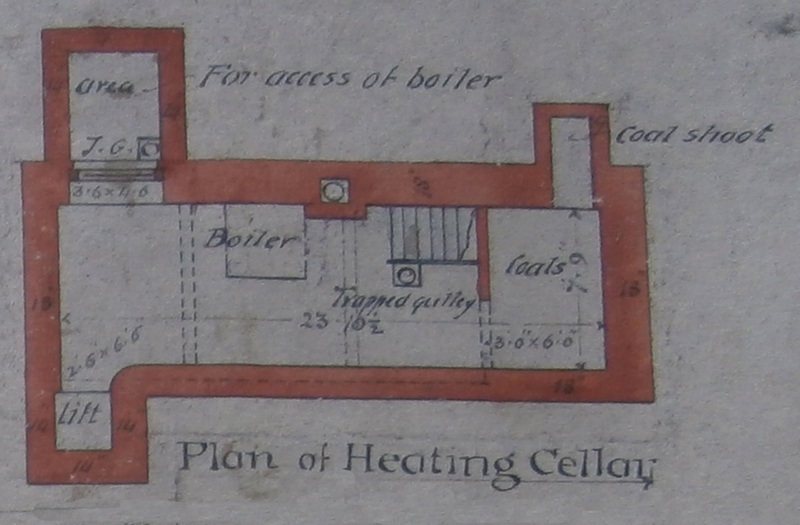 The plan also shows the position of a bicycle shed in 1927 adjoining the stone wall of the orphanage grounds (centre right) and the steps down to the Heating Cellar under the end of the north gable (left). 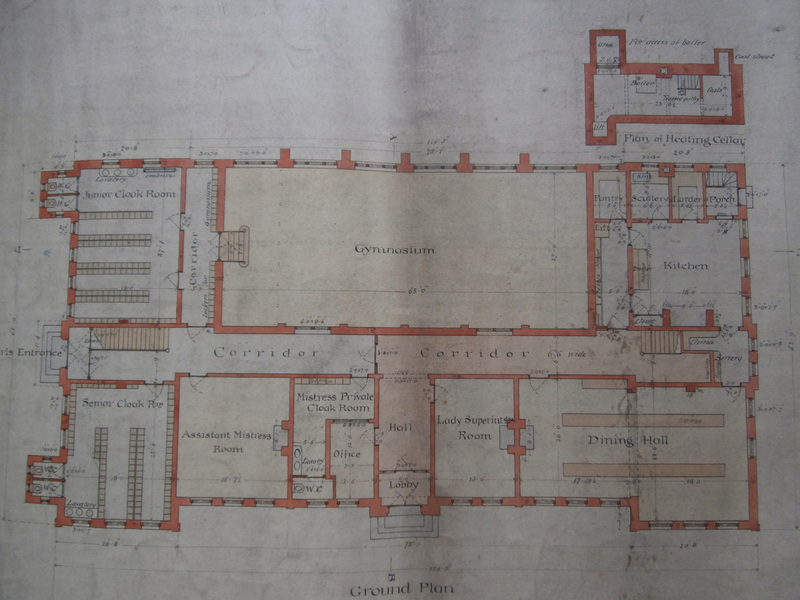 The unfinished Wood and Oakley Ground Floor plan of May 1927 shows the caretaker’s cottage bottom right (Tyne & Wear Archives). 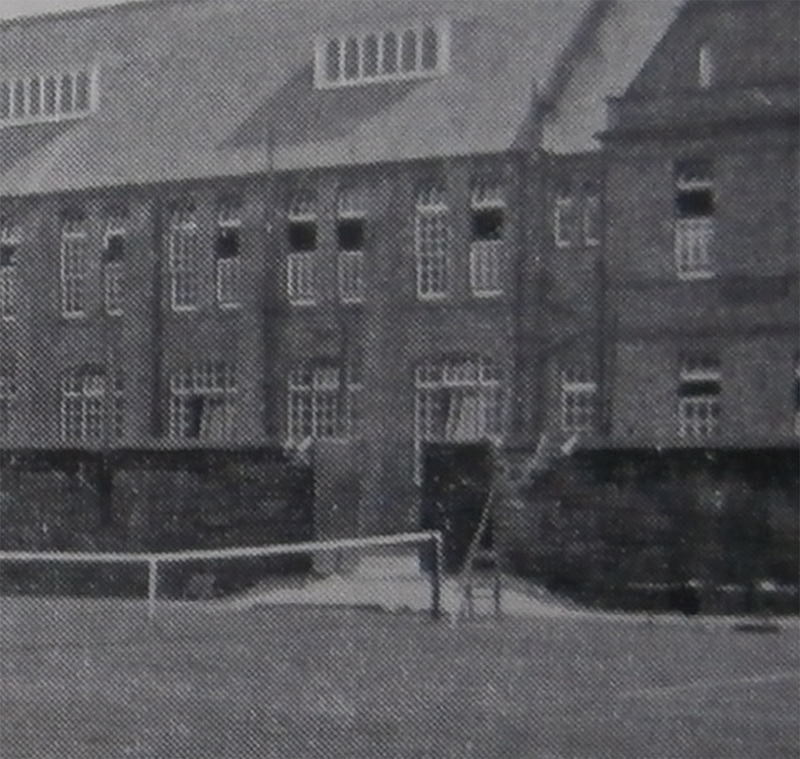 You may remember this first extension to the original Newcastle High School building was built on posts (marked as squares here) to keep the playground fully intact. The orphanage gardens wall marked the most northerly boundary of the Newcastle High School site right until the building of the Junior School in the 1970s. 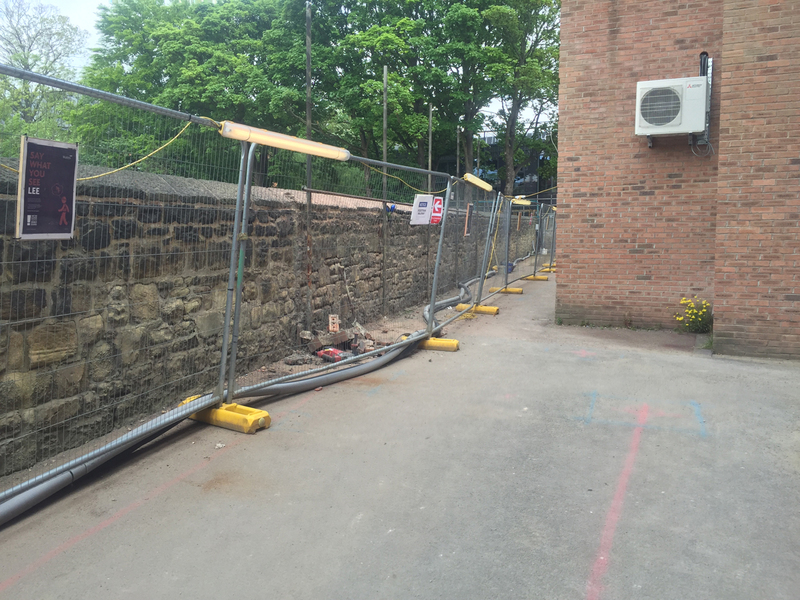 The fire-escape from the Staffroom in the 1933 extension exited beyond this wall onto the way-leave between Tankerville Terrace and what was later to become the school field. 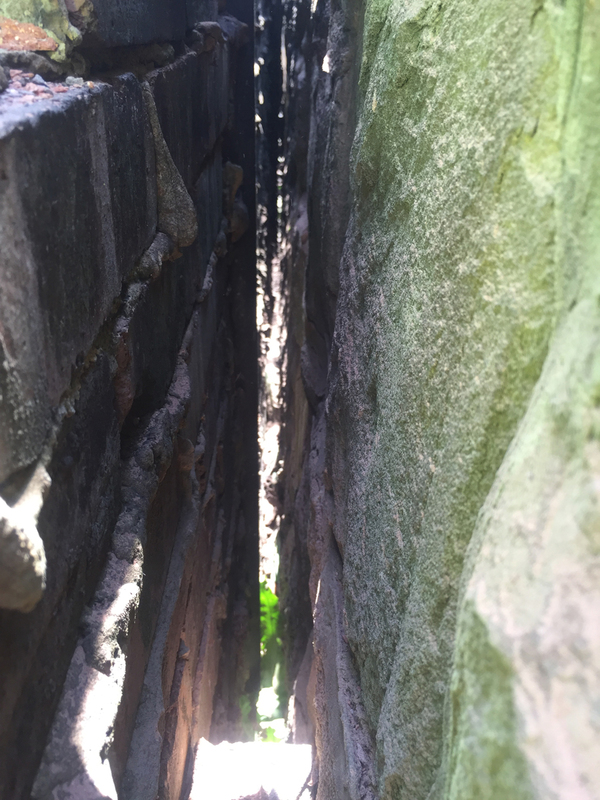 Giuseppe’s photos of the site documenting the demolition of the single-storey kitchen block to make way for the new infill extension, show the wall at the point where the cottage must have run parallel. 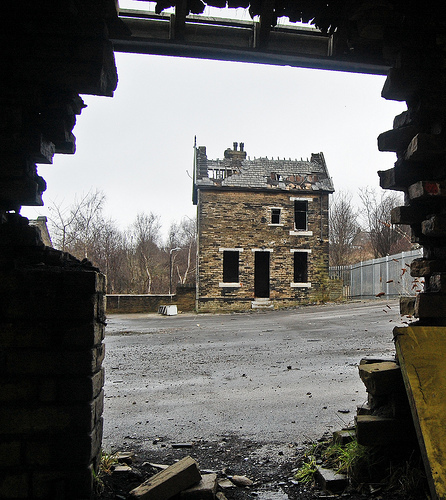 The cottage must have run parallel to the far side of the orphanage gardens wall close to where the bin-store is now situated in the 1933 north extension: to the right of the image above and to the left of the image below (taken from the 1927 Laboratory extension looking towards Tankerville Terrace) after the later kitchen extension had been demolished . 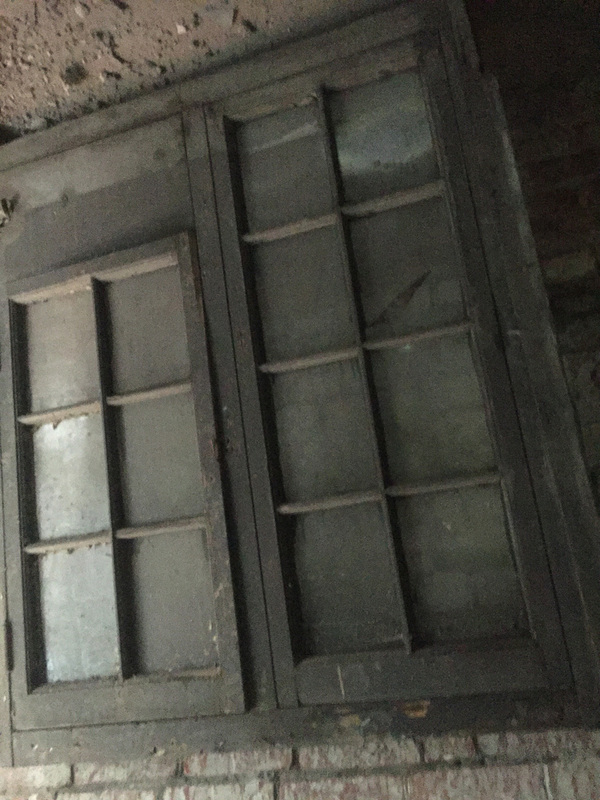 The last people to live in the caretaker’s cottage were Mr and Mrs Mattison. 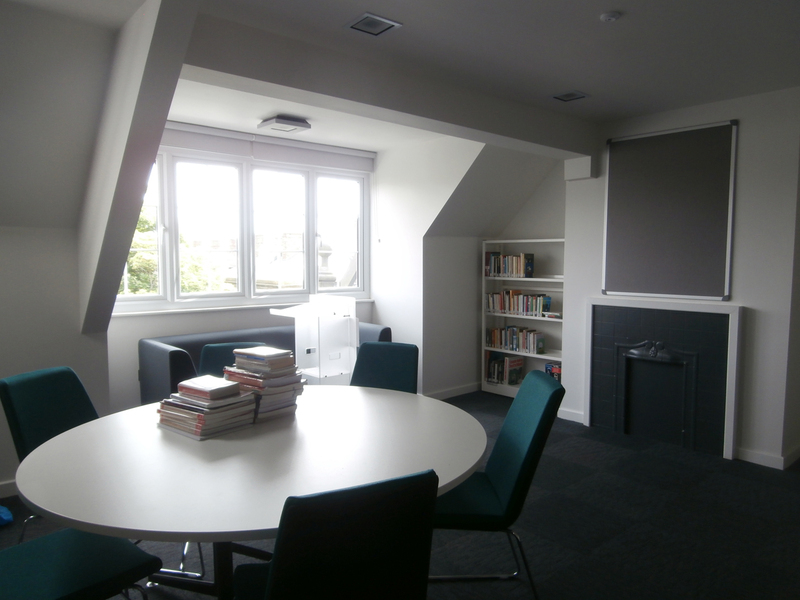 Because of this, they must have been the first couple to inhabit the new caretaker’s flat created in the eaves roof-space – and consequently, along with Major the golden Labrador, the first people to enjoy the stunning views from the new dormer windows. 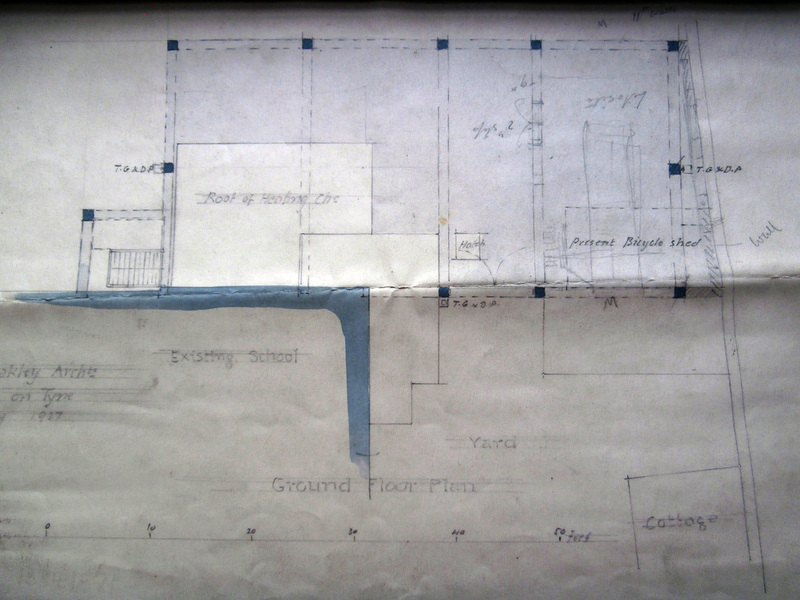 In the Archive, there is also a fascinating document, a letter to Miss Gurney from Clive Newcombe of Newcombe & Newcombe Architects dated 21st November 1932, which outlines – and provides estimated costs for – a number of possibilities for further extending the building. Miss Gurney is credited as the Headmistress who did most to move the School forward and this letter makes this abundantly clear. In 1932, no less than six different schemes for extension were under consideration. 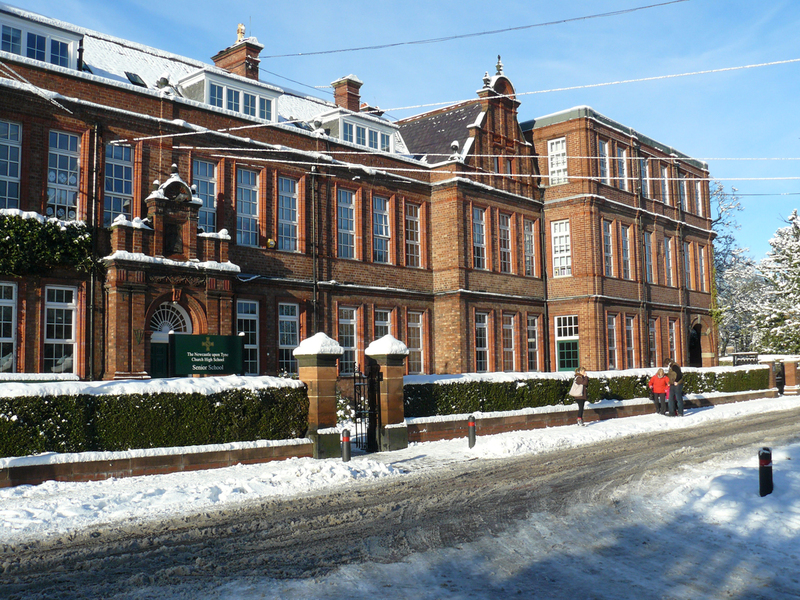 At the time, Miss Gurney and her Governors opted for Scheme C & D: a two storey extension with a boiler house and the caretaker in the roof at an estimated cost of £4,350 (with the option of adding a third storey at a later date). 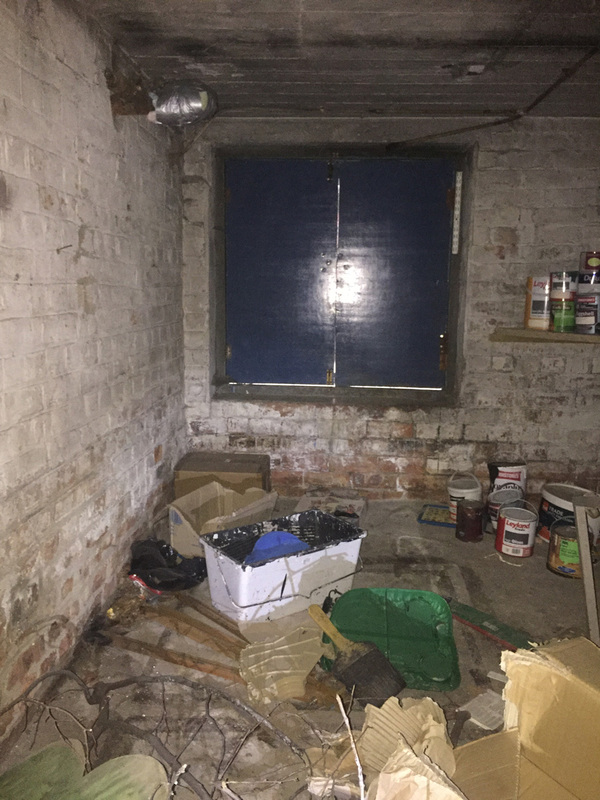 PC Newcombe’s plans for the flat in the roof space can be seen below. 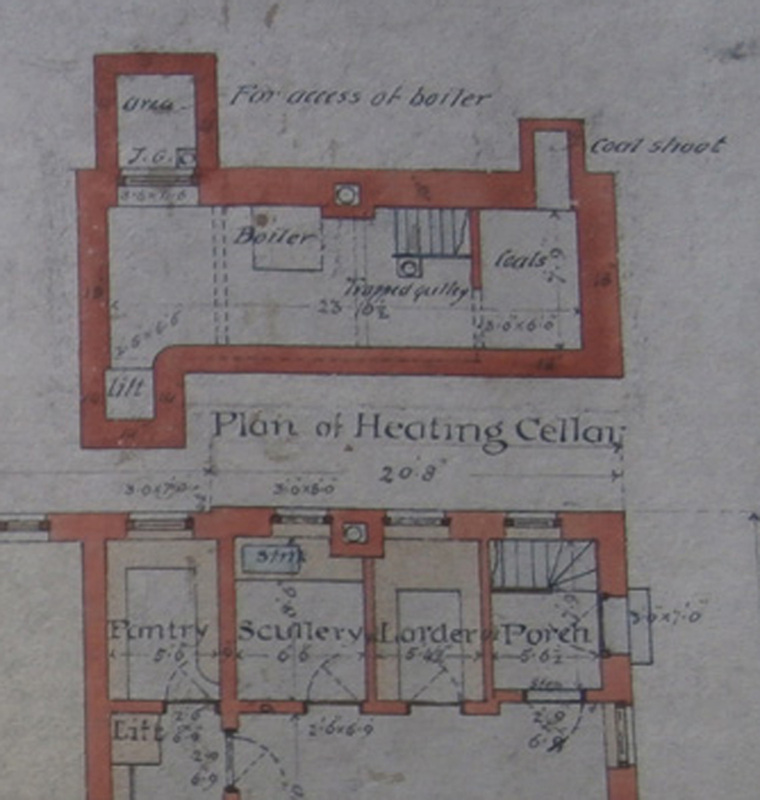 PC Newcombe’s 1932 plan for the caretaker’s flat in the roof-space shows four dormer windows to light four rooms. L to R: Living Room, a Scullery and Bathroom sharing one window and two bedrooms (Tyne & Wear Archives: E.NC17/6/1/17). For the names of the last caretakers to live in the flat in the eaves, I am indebted to Barbara Weightman. Barbara is a Church High Old Girl (although I didn’t know it at the time) now living in London who I met on two occasions while taking photographs on Tankerville last summer. Also once again at the September NCHS Reunion in the renovated building, by which time we were virtually old friends. Barbara told me she’d been up in the roof when it was the caretaker’s flat. This would have been in 1958 when she was friends with Hazel Taylor, the caretaker’s wife. I don’t know if they had a dog. 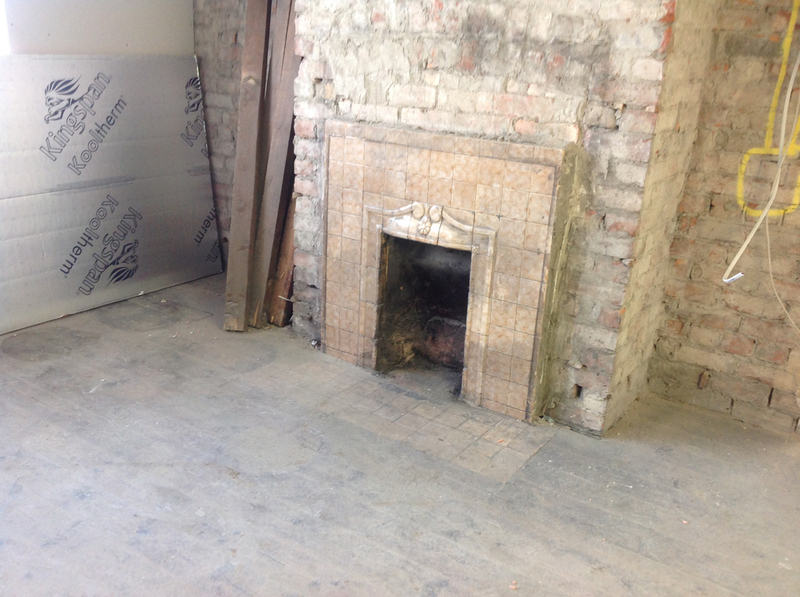 Who was to know that boxed-in behind Alison Roe’s desk was a golden-hue tiled 1930s living room fire-place and hearth? 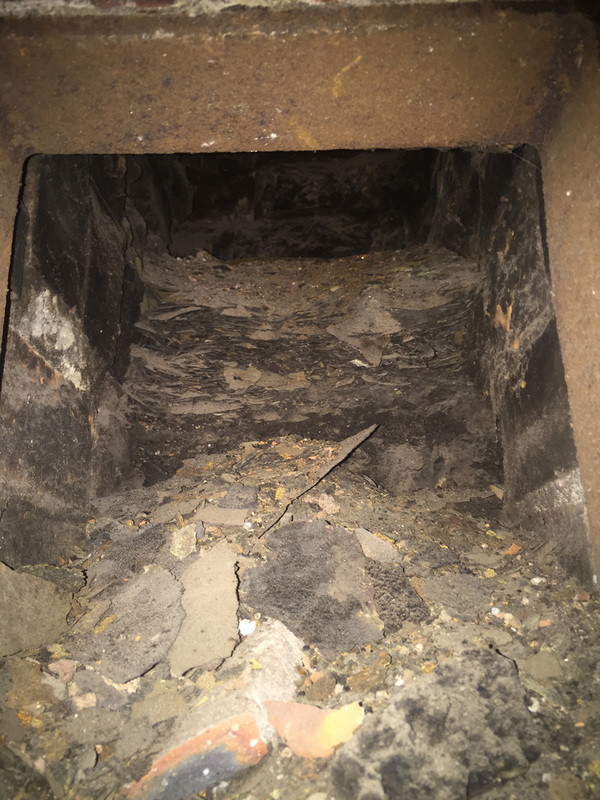 It seems such a long time ago now, but it was probably the surprise of seeing that newly uncovered fire-place in the eaves during the renovation work that first fired my curiosity about the previous life of the building. My first thought was domestic quarters and, as it turned out, I wasn’t actually that far off. This building has always been warm and welcoming, a fact the Jubilee Book expresses very beautifully, ‘always there was peace and goodwill and milk and biscuits.‘ It seems fitting therefore that an opened-up fireplace was the first reminder of the building’s past, when people did things differently. An open hearth always reminds me of the wonderful final sentence of Gabriel Oak’s proposal to Bathsheba Everdene in Thomas Hardy’s ‘Far From the Madding Crowd’, a novel I taught many times to girls at Church High: ‘And at home by the fire, whenever you look up, there I shall be – and whenever I look up, there will be you.’ So now whenever I pass by girls working at the south end of the Sixth Form Library at Newcastle High, I can’t resist saying to them, “Just imagine Mr Mattison on that side of the hearth, Mrs Mattison sitting on the other and between them on a rug enjoying the heat of the open fire, Major the dog.” The wondrous glow of the ordinary: feeling ‘At Home’.